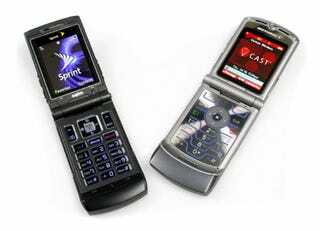 The Sanyo Katana, Sprint's version of the RAZR, turns out to be a pretty good alternative with some decent features. The Katana looks just like a RAZR, down to the VGA camera. It's available in black, blue and pink, and has a 320x240 screen (larger than the RAZR's 176x220). The bluetooth profiles support headsets, dial-up networking, and file transfers. The Java performance zips compared to the RAZR, and with Opera Mini, web browsing is pretty satisfying as well. The Katana is available for $79.99 after rebate.